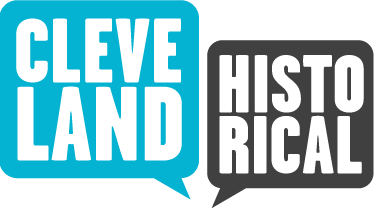 In 1910, Daniel Rhodes Hanna, a wealthy industrialist and son of legendary political kingmaker Marcus Hanna, bought the Cleveland Leader, an historic, but struggling, daily newspaper. The Leader's offices were at the time located in a small two-story building on the south side of Superior Avenue, just west of that street's intersection with East Sixth Street. Directly across Superior, a massive five-story building was slowly going up. 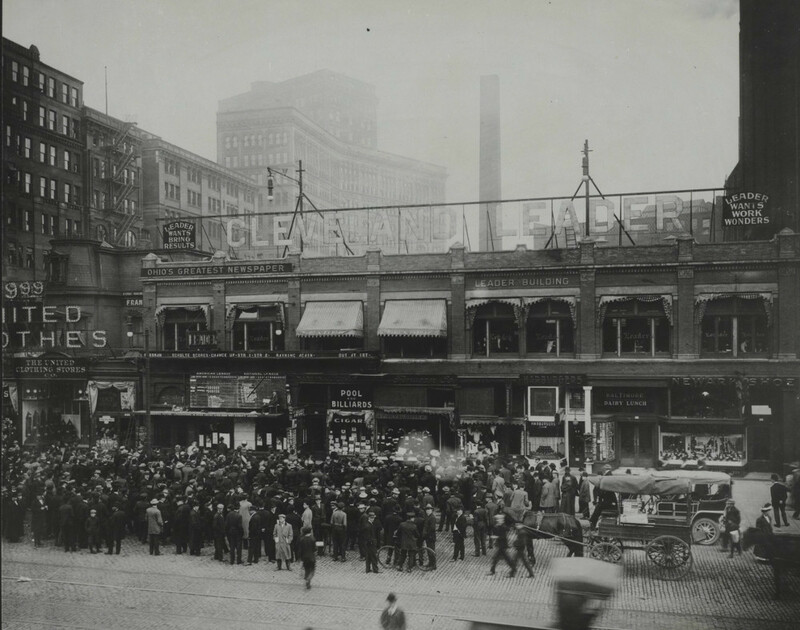 Built in two phases, and stretching all the way from Superior Avenue to Rockwell Avenue, it was the new home of the Cleveland Plain Dealer, the city's leading morning newspaper. Over the next three years, "Dan" Hanna would invest heavily in the newspaper industry in an attempt to increase the circulation of the Leader and make it, as it had once been in the nineteenth century, a viable competitor of the Plain Dealer. 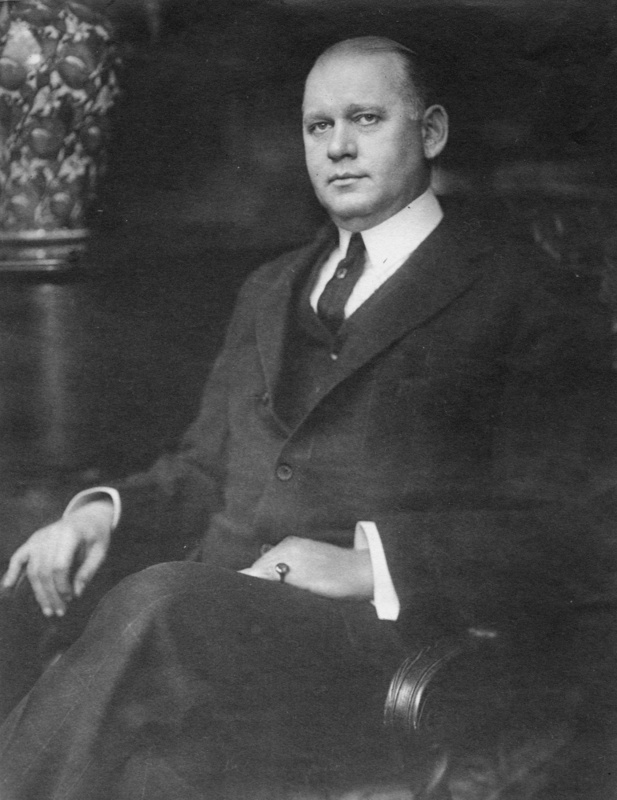 In 1912, he purchased the Cleveland News, giving him control of an afternoon, as well as a morning, daily. Then, from 1913 to 1914, he engaged in a nasty and costly circulation war with the Plain Dealer. And finally, he tore down the Leader's two-story building and replaced it with an elegant, state-of-the-art 14-story building, which not only dwarfed the new Plain Dealer building across the street, but became the largest office building erected in Cleveland to date. 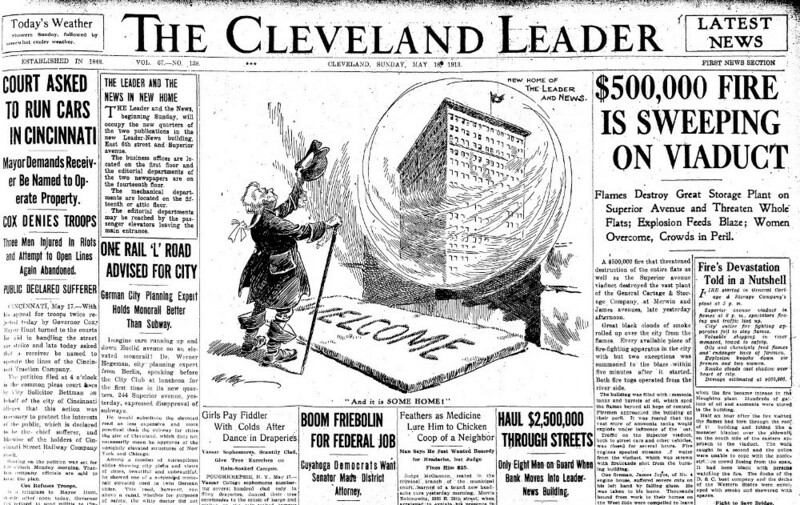 Despite the magnitude of Hanna's efforts, and the long shadow which the new Leader-News Building cast--literally--on its competitor across the street, the Cleveland Leader continued to struggle in the newspaper industry and, in 1917, it went out of business. But, though the newspaper itself disappeared from the city, the building Hanna erected did not. 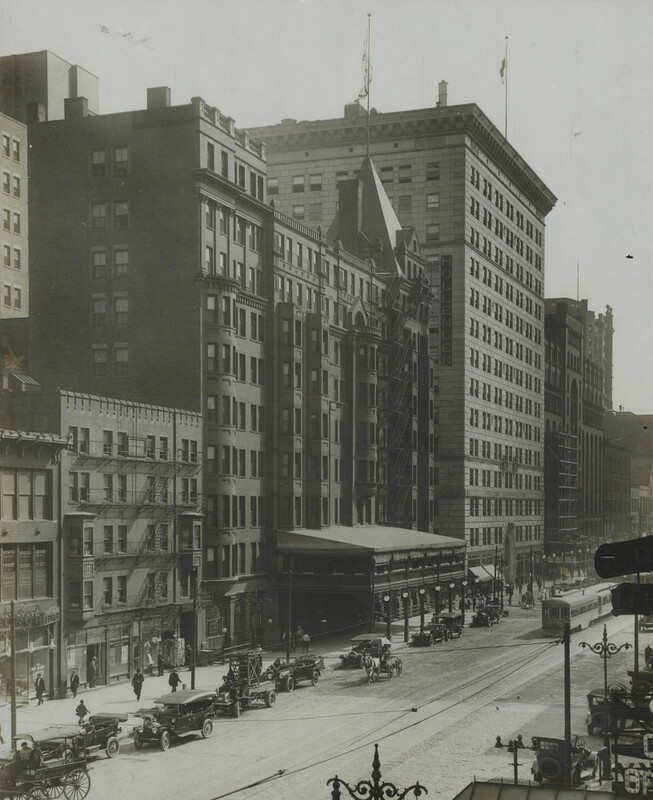 Later renamed "The Leader Building," it has now stood on the corner of East Sixth and Superior for more than a century, and, though no longer downtown Cleveland's largest office building, it remains one of its most elegant and historic. 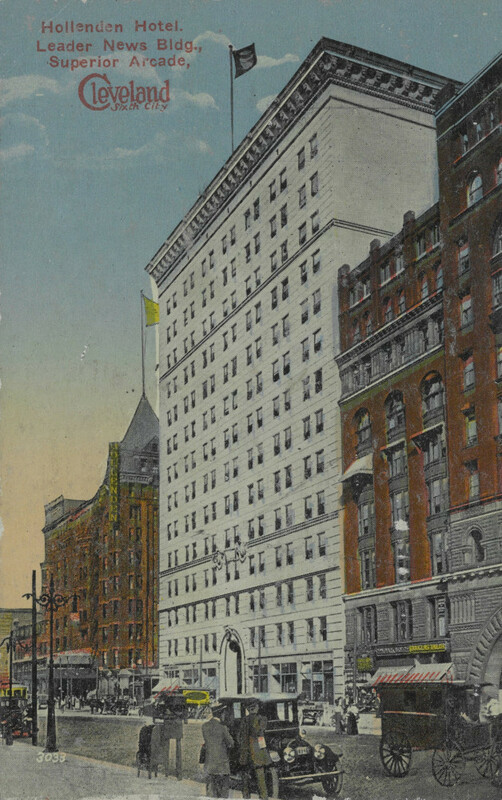 The Leader Building was erected in 1912-1913 on grounds that were already steeped in Cleveland history. 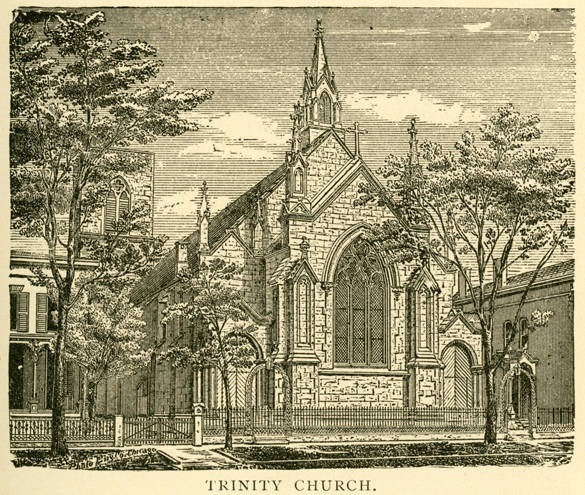 Since 1854, most of the site had been home to Trinity Episcopal Cathedral, the place where many of the city's pioneer merchants and industrialists first worshiped. 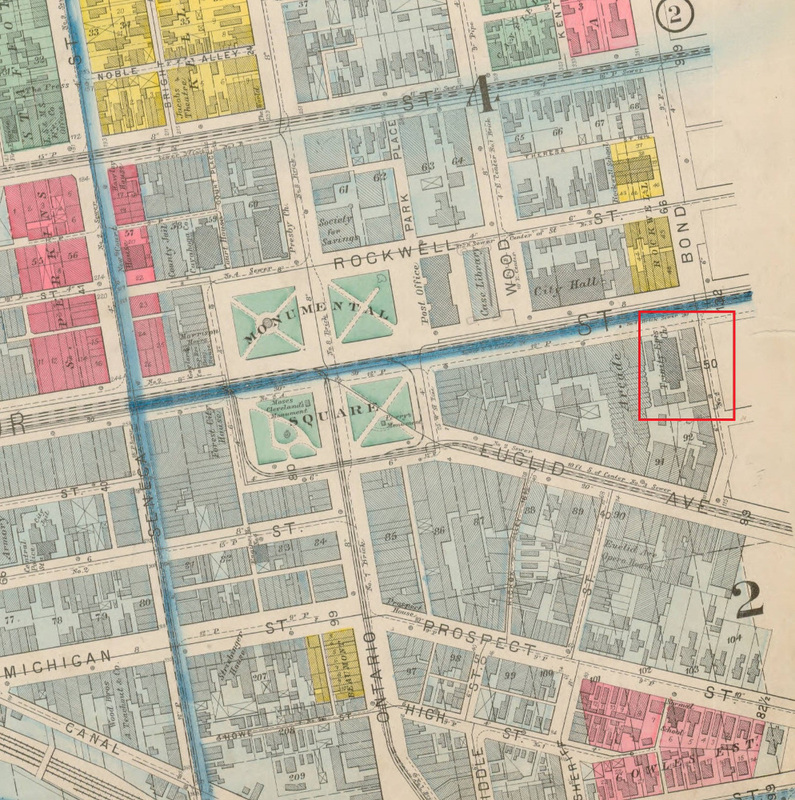 In 1902, after the Episcopal Diocese had relocated to its present-day site on the corner of Euclid Avenue and East 22nd Street, the Wardens and Vestrymen of Trinity sold the church's property on Superior Avenue to Ralph King, then downtown's largest real estate developer and a patron and future President of the Board of Trustees of the Cleveland Museum of Art. In 1905, King built a small two-story structure--call it the first Leader Building--on the site of the old Trinity Cathedral, wedging it in between the Arcade Building to the west and the Samuel Raymond mansion, by this time a boarding house with a one-story commercial addition attached to its front, to the east. 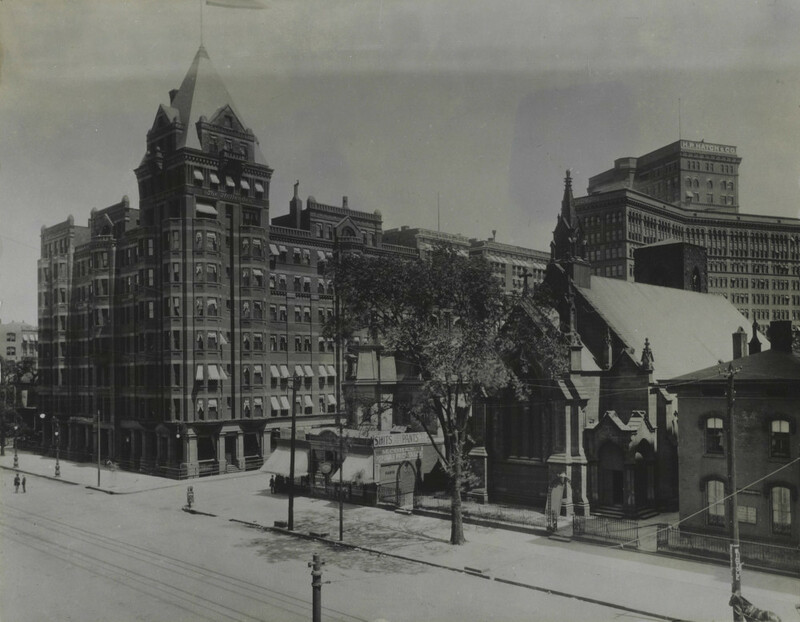 This first Leader Building was standing for only five years when Dan Hanna bought the Cleveland Leader and then arranged for the construction of the second and much larger Leader Building, which would cover all of the grounds once occupied by Trinity Cathedral and its Parish House, as well as those of the Samuel Raymond mansion on the corner. The new Leader Building was designed by Charles A. Platt, a New York architect whom Eleanor Roosevelt once referred to as "an architect of great taste." Platt designed the Sara Delano Roosevelt townhouse in New York, which is now an historic landmark, as well as many other buildings across the country, a number of which remain standing, including the Smithsonian's Freer Art Gallery in Washington, D.C. Platt's plan called for the Leader Building to occupy nearly all of the large site at the corner of Superior Avenue and East Sixth Street. 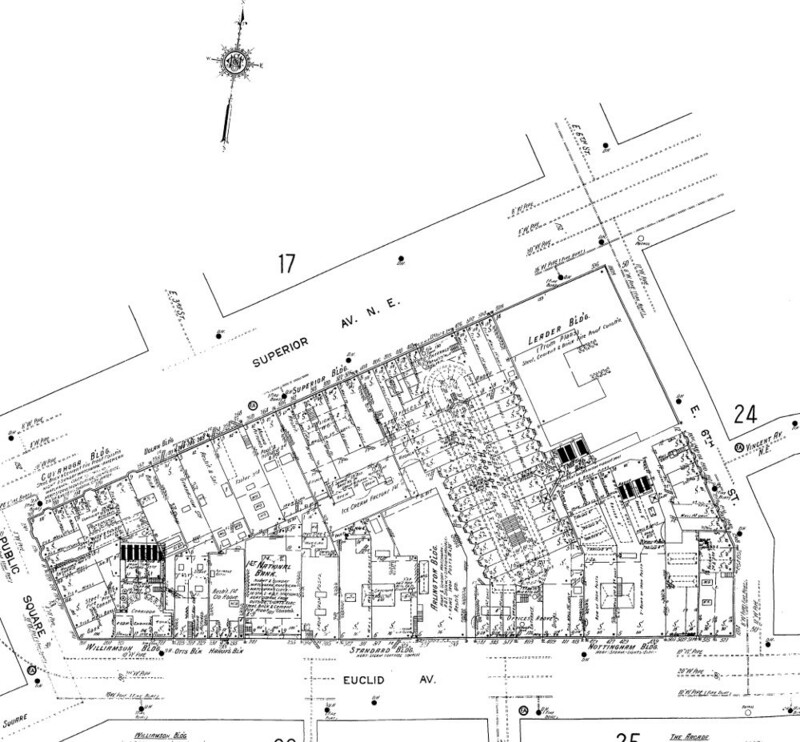 The rectangular-shaped Beaux-Arts style building with a limestone block exterior takes up 150 feet of the site's 160 feet of frontage on Superior Avenue and 215 feet of the 220 feet of depth on East Sixth Street. It has a total of more than 300,000 square feet of interior space, almost 250,000 square feet of which over the years has been built-out for offices. 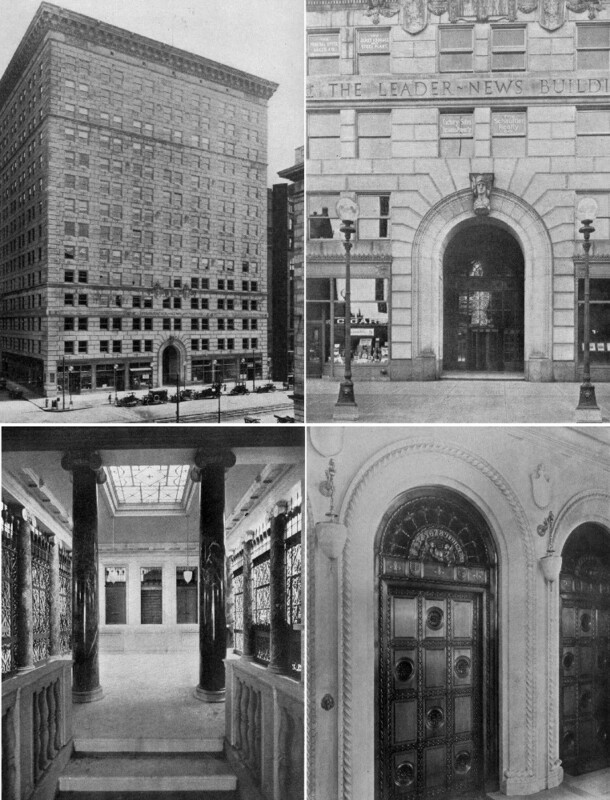 The interior of the building is constructed with many notable quality materials, and features marble walls, maple wood floors, a grand lobby with columns, wrought iron screens and other ornamentation, and bronze elevators said to have been designed by Tiffany. 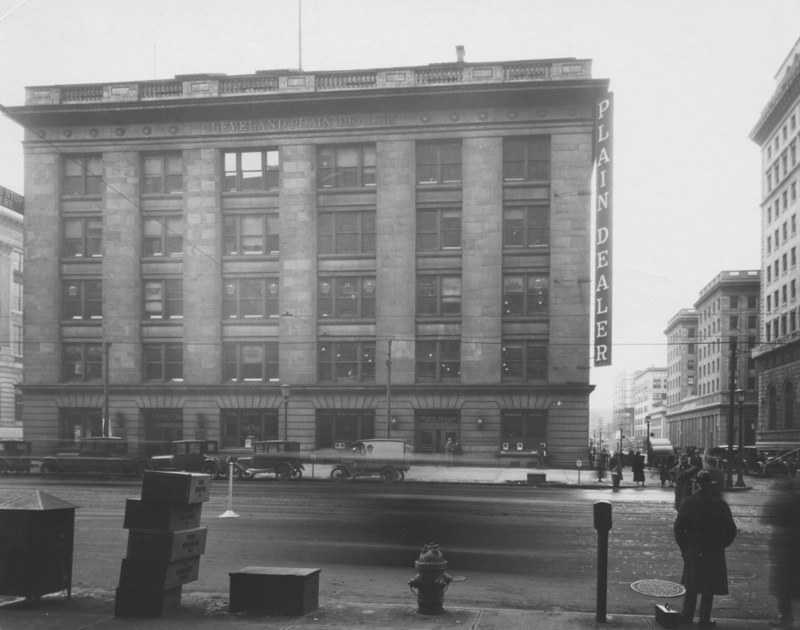 When the Leader Building first opened in 1913, it housed the presses of the Cleveland Leader and the Cleveland News in its basement. Its first floor was entirely occupied by the business offices of the two newspapers and the fourteenth (top) floor by the staffs of the two separate editorial departments. The remaining 12 floors were leased to a variety of business tenants, including the prestigious law firm of Squires, Sanders and Dempsey, which rented the entire 12th floor. After the Cleveland Leader went out of business in 1917, the Cleveland News continued to occupy the basement, and first and 14th floors of the Leader Building until 1926, when it moved to a new and more modern newspaper plant building at East 18th Street and Superior Avenue. The basement, which formerly held printing presses, became home to the Colonnade Cafeteria, which served building tenants and others working downtown for the next 60 years. As the years passed, the Leader Building became known not for the newspapers once printed there, but instead for the many law firms that continued to locate there. In the early years of the twenty-first century, however, a glut of available office space in the downtown area developed and tenants began to leave older buildings like the Leader Building. In 2014, with its occupancy rate declining, the building was sold to K & D Properties, a local company specializing in real property management. 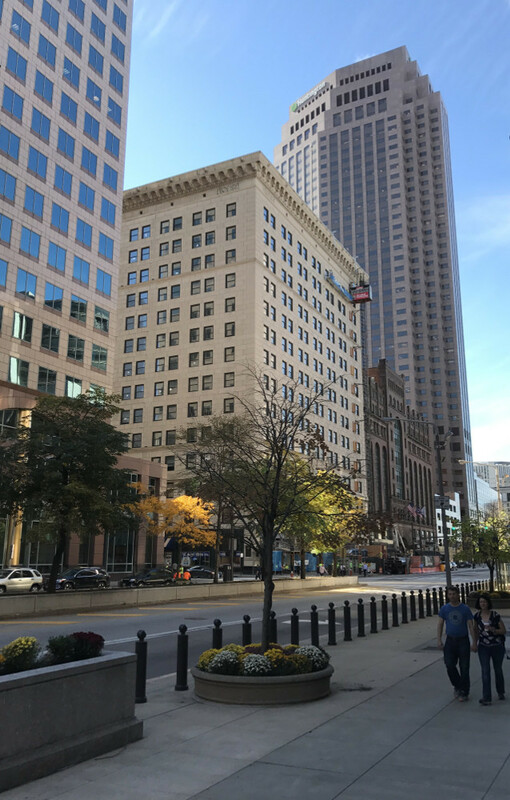 In 2016, K & D, in response to a demand for more residential units in downtown Cleveland, began converting the upper floors of the Leader Building into apartments. It is a process that, in recent years, has given new life to many downtown buildings, and now promises to give new life to the historic Leader Building. Jim Dubelko, “The Leader Building,” Cleveland Historical, accessed April 18, 2019, https://clevelandhistorical.org/items/show/770. Published on Oct 16, 2016. Last updated on Dec 19, 2017.